The sensor panel is missing fans, VRM, DIMM temps, etc. Will this board be supported? @Fiery Any way to display the DIMM temperature? I also noticed when on the sensor page, it constantly blinks, refreshes, and sends the scroll bar to top. Thank you for your feedback. 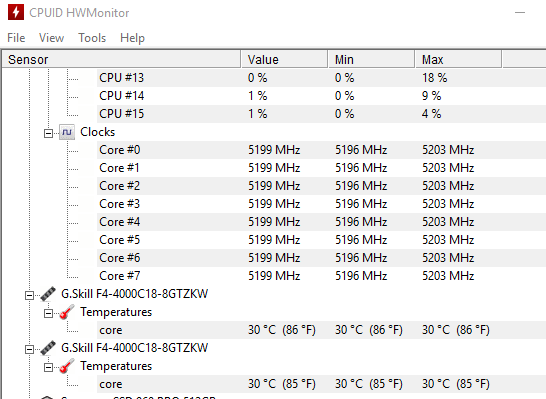 Can you please send us a photo of the HW Monitor page of the BIOS Setup (UEFI Setup) where it shows all thermal readings, including the DIMM temps? The blinking is usually caused by an unstable reading that appears and then disappears from the Sensor page. If it's possible, please try to find the reading that gets appearing and disappearing, so we can check its register content. The blinking seems to be caused by a fan sensor labeled, "Chassis" under the cooling fan section. It shows up, then disappears, then back. The fan that is connected to the Chassis PWM port is set to PWM static at 80%. 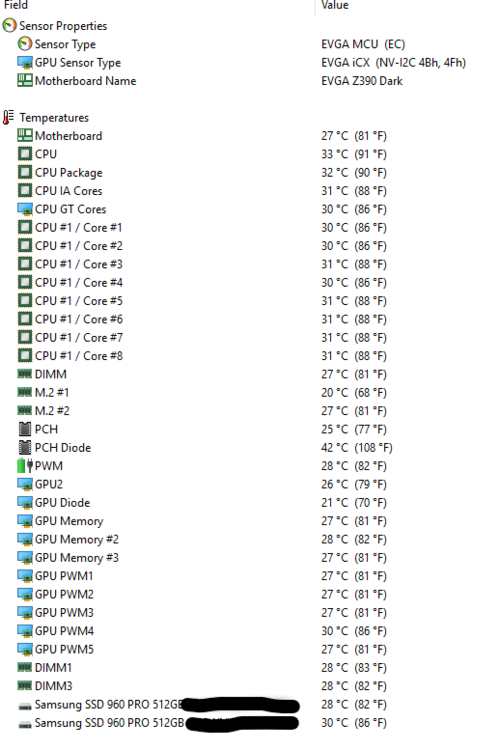 Additionally, is it easy to rename some of the temp sensors to align with the BIOS naming? More specifically, the "ATX 6P", "VDIMM VRM", and "SYS" temp? Thank you for your help. We'll rename the temperature labels accordingly, and also implement caching to make sure the Chassis fan reading can be measured more stable. IMHO it's not the fault of your motherboard or AIDA64, but more like due to the fan itself providing unstable fan speed signals to the motherboard. We'll apply those changes to the next AIDA64 beta update. As for DIMM temperatures, simply enable DIMM thermal sensor support in AIDA64 / main menu / File / Preferences / Stability, and restart AIDA64. Just like in other cases, I will post a message into this topic once the new AIDA64 beta build becomes available for download. @Fiery any update on when the next beta version will be released? Not quite sure what happened here, but it seems worse than the last beta. The DIMM temperature is mislabeled? The correct ones are DIMM1 and DIMM3. There are 2 PCH values? The M.2 fields are listed incorrectly, the correct temperatures are listed in the Samsung SSD fields (the M2 temps above correspond to these so no need to list it twice). 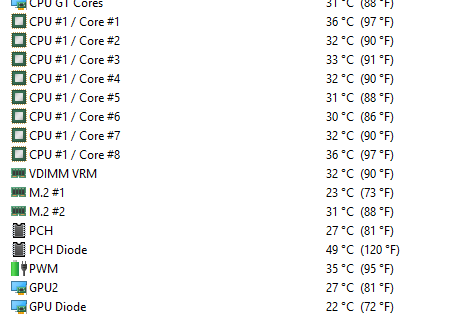 There should be ATX 6P and VDIMM VRM temperatures. If you look above, those are the only temps that were not shown in the last beta. 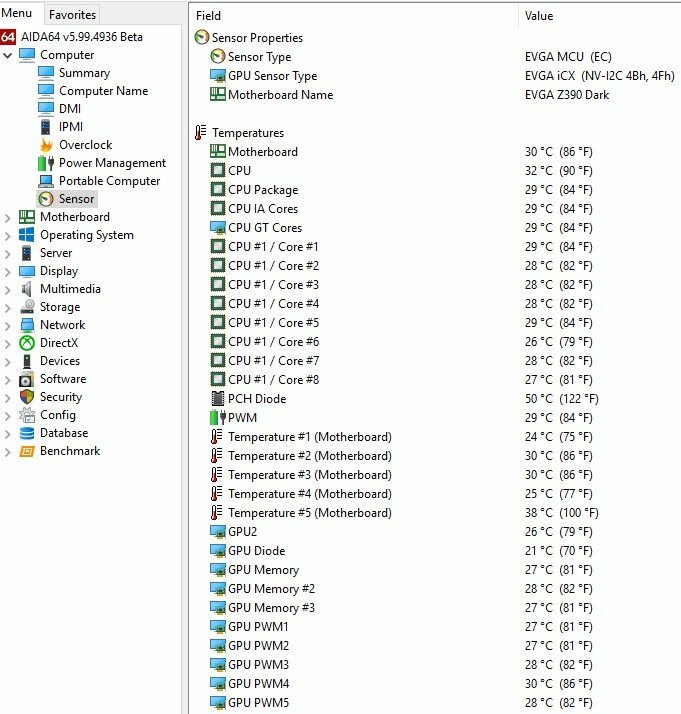 The Motherboard temp below is the Sys temp. Are you able to use the data dump i provided in the first post to see exactly what values correspond to the sensor labels in the picture above? Do you have any labels that you previously have renamed on the Computer / Sensor page? The two PCH values should be correct, since one of them ("PCH") comes from the EVGA Z390 Dark MCU, but the other ("PCH Diode") comes directly from the chipset of your motherboard. The thermal reading labelled as "DIMM" should indicate the one that's labelled as "VDIMM VRM" in the UEFI Setup. There's a glitch about showing ATX 6P thermal reading. We will fix it in the next AIDA64 beta update. As for the two M.2 temperatures, they come from the EVGA Z390 Dark MCU, while the two bottom thermal readings showing your SSD temperatures come directly from your SSDs. They have no direct relation to each other, and they are all meaningful readings. Awesome, thanks for the explanation. I have not relabeled any of the sensors. Anyway to rename the DIMM sensor to “VDIMM VRM” by default? On the Computer / Sensor page you can modify labels by (single-)clicking on them. If you want to restore the default label, just clear the text and press Enter. @Fiery I did some further analysis on temp configurations and my suspicions were accurate. The current labeling (probe to temp matching) by default is incorrect. I was not able to snap pics fast enough but the data points to the below being the correct mapping. Sure, I'm able to manually change them myself but thought it might help to have the defaults correct. Additionally, I was able to further verify the M.2 #1 and #2 mapping by running stress tests on each drive. We'll alter AIDA64 accordingly in the next beta update.